Information: Producers of sound recordings. The Rondo Record Corporation label was started in Chicago in the late 1940s, with Julius F. Bard as President and Nick Lany as Executive. By far their biggest claim to fame was the 1948 organ smash hit "You Can't Be True, Dear" by Ken Griffin. This particular record was a staple in the carnival/fair/amusement park "merry-go-round" repertoire, as well as roller skating and ice skating rinks. Eli Oberstein died on June 12, 1960, and his son, Maurice, took over operations at the label. In late 1961, the label was sold to Precision Radiation Instruments (PRI), Incorporated, located in Los Angeles. This lasted a few years (Rondo was known to be reissuing albums at least as late as 1965), then Rondo was down for the count. A-26  Carlos Montoya Plays the Flamenco Fire Guitar. Carlos Montoya. 197  Dennis Waltz (Take me Out to the Ball Game). 606  Dance in Glenn Miller Style. 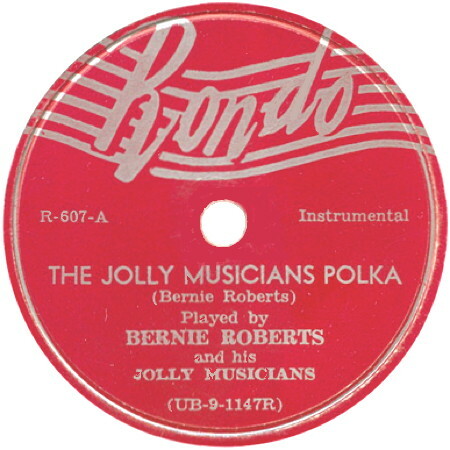 607  The Jolly Musicians Polka. 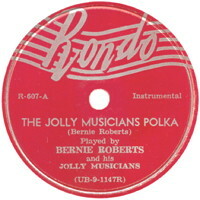 Bernie Roberts and his Jolly Musicians. 611  Romani Music. Al Samanda & His String Orchestra. 617  Dance in Dorsey Style. Maurice Rene. 618  Strauss Waltzes. Al Samanda & His String Orchestra. 634  Pleasant Polkas. Polka Players Dance Group. 636  Brahms' Hungarian Dances. Peter Mattos. 656  Tchaikovsky: 5th Symphony. Albert Cohen & London Symphonia. 661  Polka-Go-Round. Tommy Clayton & His Polkateers. 675  Cha Cha Cha. 677  Dance the Twister. Bunny Chess & Twisters. 912  The Blue Danube and Other Strauss Waltzes. Ira Wright & His Orchestra. 922  Viennese Waltzes. Ira Wright & His Orchestra. 924  Romani Fire. Gabor Kalt & His Orchestra. 925  Let's Dance in Stereo. Ira Wright & His Orchestra. 1762/9762  Dance Party Featuring Johnny Desmond. Johnny Desmond. R-2003/RS-2003  Polkas. Fankie Yankovic & His Yanks. R-2017/RS-2017  Dance Band Greats. Various Artists. R-2023/RS-2023  Polka Greats. Various Artists. RLP-28  Polka Parade. Plocar's Harmony Hawaiian Quartet. SA45  Paso Dobles and Mambo. Juan Perez. SA54  Viennese Waltzes. Ira Wright & His Orchestra. SA55  Latin Rhythms. Adolpho Igorman. SA55  Flaming Romani Music. Oscar Nagy. SA67  Dancing Stereo Music. SA72  Cha Cha Cha and Mambo. Juan Perez. SA116  Stereo Dance Tribute to Glenn Miller. Ira Wright & His Orchestra. SA120  Dance Party. Ira Wright & His Orchestra. SA162  Fiery Popular Dance Rhythms. Russ Case Orchestra. ST-503  Flamenco Fiesta. Carlos Montoya & Troup. ST-526  Flamenco Holiday. Carlos Montoya. ST-534  Strauss: Vienna Waltzes. Suzanne Auber & Vienna Symphonette.